The entity to whom Dutch group, Lifehunters, attributes the museum quality artwork in the video prank above doesn’t exist. The “famous” Swedish artist’s handle --IKE Andrews --is but a puckish reference to IKEA, the purveyor of the 10€ print (oh snap, it’s not even an original!) various unnamed “art experts” are asked to evaluate, having been led to believe it’s something rare and wonderful. IKE Andrews’ fellow fictional entity, Borat, would be gratified by how readily these experts accept presenter Boris Lange’s suggestions as to the value of this work. So how bad is this “painting”? Walter Keane bad? Margaret Keane bad? Is it a Velvis? A sad clown? The sort of crummy landscape artist Wayne White might snap up in a thrift store? As several YouTube, Twitter, and blog commenters have mentioned, the print itself is pretty cool. It’s a media frenzy, but interestingly, the artist is not coming forward to herald his or her role in the hoax. Make that artists. Turns out IKE Andrews is a pair of Swiss street artists, Christian Rebecchi and Pablo Togni, who collaborate as NEVERCREW. These models, as such, from time to time actually contain more or less extensive realities, represented as autonomous systems of which the reality of the viewer becomes a part. This then the rapport becomes the very subject, mainly highlighted as the relationship between man and nature (between human being and its nature), but automatically extended to a vision of total and inevitable relationship between everything, between every part, where it is only the point of view, the position within a system, to define a selection. We call the theme “living structures” and we like to see them as models of living systems. We would like our art to generate interest and curiosity, and the viewer to become a part of the mechanism with his or her thoughts, perspective and emotions. Philosophy’s all well and good, but what's it actually look like, this “Message in a Bottle”? 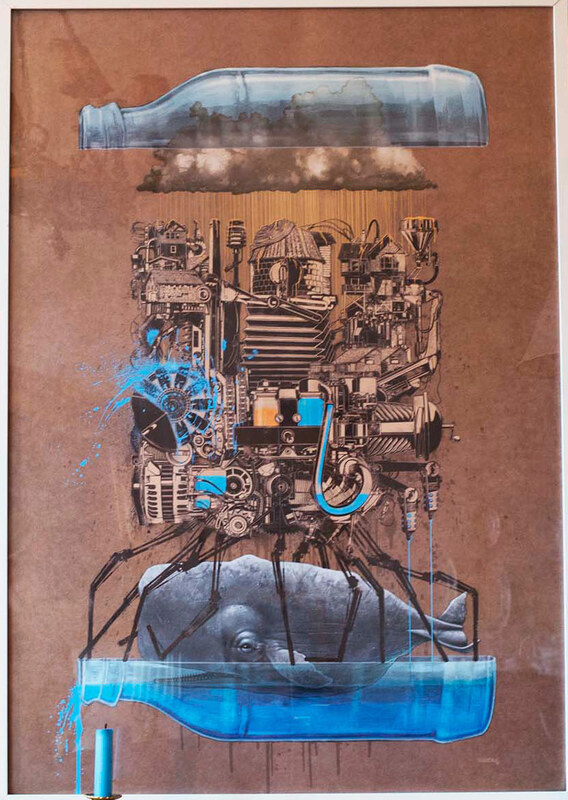 Well, it seems to me to be a bottle, implausibly halved lengthwise to reveal a bunch of steampunk stuff balanced atop robot spider legs, forming a cage around an ancient-looking whale. Also, a cloud raining yellow liquid, or possibly light. (Hopefully the latter). Oh! And it appears to have been painted on a brown paper bag. I can think of plenty of people who’d not only like it, but find meaning in it, as the experts do. The only difference is the experts do so on camera, a fact not all of them are willing to laugh at, when host Lange informs them they’ve been punked. The artists aren’t the only ones playing it cool. The internet may be exploding, but so far, neither IKEA, nor the Netherlands’ Arnhem Museum, where the prank was staged, have made mention of this business. That’s a cool painting. It’s an old, sad-looking whale, a member of a magnificent and intelligent mammalian species, in side a bottle, of all things. A whale should of course be in an ocean, but this one is in a bottle. The whale is confined, cramped and incarcerated, ridiculously, in a manufactured object. It’s also being grasped, or perhpas permanently fondled, by a complex of mechanisms that serves some unidentifiable purpose (or maybe none at all). The machine is broken, possibly, because it’s letting water escape, at such a rate that seems likely to soon parch the whale. Dirty looking clouds ironically are putting forth fake-looking light. A lone candle sits outside the mad world of the receptacle, unlit. Would its light be of any use? Do single, singular, individuals outside the system enlightens those within it? We can only hope. This is an amazing painting. Art in any form is appreciated. A layman can also learn the art of painting by flowing guidelines and using kits. One such beautiful art is 5D painting which can be easily learnt by various kits available for it in the market.